Enjoy a private walk-through of the exhibition Of God and Mortal Men: Masterworks by T.C. Cannon from the Nancy and Richard Bloch Collection, and through the lens of guest artist Steven Yazzie, spend time in our Dorrance Education Classroom to complete your own guided art activity to take home! Suitable for guests of all ages. This is a specially ticketed event and space is limited. Steven J. Yazzie (b.1970) Newport Beach, California; lives and works in Phoenix, Arizona. Yazzie is a proud member of the Navajo Nation and a veteran of the Gulf War serving honorably with the United States Marine Corps. 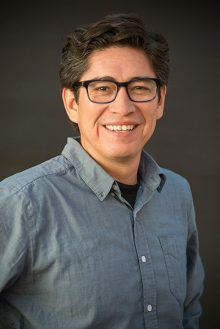 He received a Bachelor of Fine Arts degree in Intermedia at Arizona State University and was named the 2014 outstanding graduate for the Herberger Institute for Design and the Arts. He also studied at Skowhegan School of Painting and Sculpture, Maine.